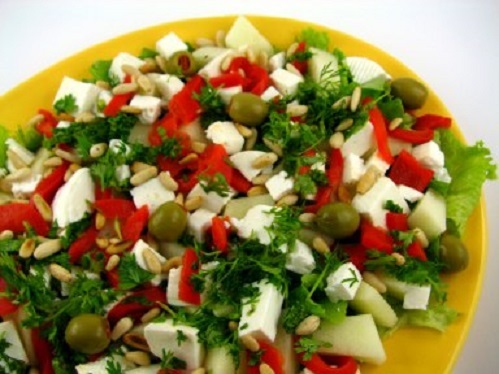 Melon and Fresh Cheese salad is a Mediterranean Portuguese style salad which combines sweet and savory flavors together in a wonderful and easy to make dish. This is perfect to eat at any time of the day and is really a healthy and hearty salad which will give you the right energy for the rest of the day’s challenges. The sweet and fruity combination of the melon along with the savory and rich fresh cheese really makes this dish quite delicious and unique. We are sure you’ll love this one. 1) In a bowl mix together the lettuce, melon and funcho. 3) Chop the pepper, then add it to the bowl as well. 4) Finally, add the black olives, toss it one final time, then serve on a plate and enjoy! There are many options for ‘melon & cheese salads’, and countless for fruit salads. However, THIS recipe makes among the most interesting flavor/texture/presentation options I have made. I never hesitate to veer from printed recipe, particularly when substitutions have proven to be very successful with diners. a combination of nicoise olives (Fr. : Cailletier, It. Taggiasca) and ripened black olives (the small, somewhat shriveled olives cured with Mediterranean herbs). Use a sufficient amount for each serving. a full melon, cubed – I prefer a ripe cantaloupe to a musk or Persian melon. Use the single red bell pepper diced the same size as the cubed ingredients, salt and fresh cracked black pepper. Use the best OVOO and, if you can get it, a 3 or 4 leaf balsamic (the very best- balsamics are plentiful, but the best bear 1 to 4 grape leaves on the label, for being the finest quality & flavor possible). Blend the dressing to your taste. Mix everything together. Plate the greens for each diner, then spoon the mixed ingredients onto the center of the greens and serve. This is a show-stopper, a diner’s favorite, is regularly requested, and can be served as a vegetarian meal-in-a-bowl.